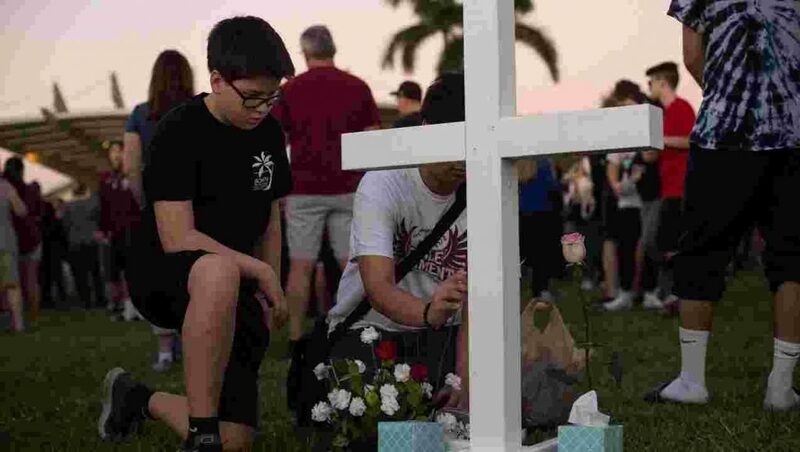 The horrific Parkland, Florida shooting at Stoneman Douglas High School on February 14, 2018 has once again unleashed a massive national debate about guns and safety. Young people lobbied in Tallahassee, police were blamed for timidity and cowardice, and new laws are being discussed. I’m all in favor of dealing with evil and saving lives. I just want an honest and big picture debate that has little to do with political biases and much to do with solving the problem. That means going on offense and defense to protect the kids. First, let’s break through the hype, hysteria and silliness and point our who’s responsible for the taking of seventeen innocent lives in Florida. Let’s begin with who’s not responsible. That includes President Trump, regardless of what Barbara Steisand opines. Nor Governor Rick Scott or other government leaders. They’re far removed. The NRA should be absolved. Their commitment to the 2nd Amendment is laudable and millions of law-abiding members had nothing to do with this carnage. Shame on the businesses who severed their ties with the NRA due to boycotting pressures. Let’s counteract their bullying by refusing to do business with these corporations until they change their ways. First, the crazed and demonic-induced shooter who admitted to hearing voices in his head. He stands singularly guilty for this specific act of evil. We should never have printed his name or displayed his face on television to give him some days of fame. It’s okay to describe his background, mental problems, and broken family etc. as a way of learning how to prevent future atrocities. But anyone who commits heinous crimes like this should be silhouetted or given a satanic logo to represent him in the media–and his name should never be remembered again. Second, it appears that some of the arriving policeman are responsible for giving wrong orders and not storming the building. The full evidence remains to be scrutinized, but the facts thus far indicate that Broward County Sheriff Scott Israel and others under his command failed at their duties. Finally, it’s fair to say that secular-progressive, self-centered, entertainment-oriented culture is broadly to blame for creating the moral climate that leads to these massacres. Pushing God and his principles out of our public life has left a huge void in human hearts that incites and desensitizes people to evil. All of us, to some degree, share in that cultural guilt. Let’s also remember that part of the demonically-inspired secular agenda is to take away all weapons in human societies for the purpose of control (tyranny). Other than some reasonable fire arm restrictions, the usual clamor for gun control is aimed at dis-arming the populace, making us stooges of an all-powerful state. So instead of wrongly-headed blame or foolish ideas, if we really want to deter gun violence in this nation, and especially in our schools, what do we need to do to protect the kids? Let’s fall back to a proven principle in team sports: You need a good offense and a good defense. Let’s start with the defensive side of the ledge because, as any follower of team sports knows, it’s “defense that wins championships.” Then let’s discuss some long-term offensive strategies that could produce a much safer and civil society. Surely one of the stupidest ideas ever brought to American campuses was the concept of gun-free zones. If there are no guns in school, then would-be murderers/fame-seekers have all the shooting to themselves. Every grade school, middle school, and high school in America should invite local law enforcement and military assets to visit their campus and suggest a comprehensive plan for making their school safe. That’s what the cops and soldiers do for a living. Let them show us how to “Harden the Schools.” This should be done at the local level. A number of cities and towns have successfully placed police satellite offices in all the schools of their jurisdiction. This de-centralizes the police presence and places cops in the community where they belong. The added security in every school would be an incredible deterrent to the bad guys and create an admirable bond between law enforcement and the folks. Might not be possible in larger cities. Let’s employ retired cops and military in their place. These won’t be feasible at some campuses like Stoneman Douglas High. It would take too long to get 3000 kids into their classes each morning. But at many schools, they would be just as valuable an option as their use at airports, city halls, sports stadiums, and other public facilities. Metal detectors save lives. We should arm teachers who are trained and adept at handling a gun to deter crime on campus. If a would-be mass murderer knows that 10-20% of the adults at a given school are armed and will shoot back, they will think twice about coming. Simply makes sense–and should be voluntary. There’s no reason not to raise the age of gun-buying to 21. We do it for everything else that requires adult maturity. Exceptions can be made for those in the military and other special circumstances. This simple law change might have prevented the Parkland shooting from taking place. All these defensive measures, taken together, would make our schools just possibly the safest places in America. It can be done. Now let’s turn to the offensive bigger picture. The reason these atrocities didn’t happen in the 1940’s and 50’s and are now common in the 21st century rests primarily on the spiritual/social/moral changes that have taken place in the United States in the past sixty years. We’ve removed the Bible and prayer from our schools and many lives. The “fear of God” is a lost and quaint concept to many–and is ridiculed by others (think Joy Behar). So what do we need to do, spiritually and sociologically, to make America good and safe again? 1. Revival in the Church. I truly believe that as the Church goes so does the culture. God’s people were meant to be the “light and salt” of nations, and when we fail to live and multiply our faith, everything goes to hell in a hand basket. Let’s pray for wide-spread revival in the Church. 2. Prayer in our Homes and Schools. Let’s increase prayer in our homes again, prayer for our schools, encourage prayer meetings at school (beyond See You At the Pole), and 24/7 prayer in our houses of worship. When I was in high school, we enjoyed a prayer meeting of sometimes 150 kids each morning before class.. Shootings are rare in the presence of much prayer. We must fight for school curriculum that emphasizes character, civility, and social graces. The greatest defense against evil is self-control–which comes about when godly character truths are taught and promoted in society as a whole. Start with yourself. No kids should be isolated in life and at school. In our King’s Kids ministries, we often pair up kids for sharing, accountability, friendship, and “having their back.” This buddy/buddy system that might have impacted and deterred the Parkland shooter. Let’s motivate the kids to get “off the machines” and into real friendships again. Is there any reason why every kid in America can’t have an adult mentor in their life to guide them to become good and successful citizens? I’ve participated in a number of mentoring programs over the years–and it’s one of my key activities today. American adults can do this for the sake of the next generation. There will always be evil in this world. But evil doesn’t multiply when godliness and justice (safety) stand as societal pillars. We can do this if the people, not the government, take the lead. Let’s go on offense and defense for the sake of the kids. Amen. All time favorite post. THIS IS A DIRECT OUTCOME OF REMOVING GOD FROM OUR SCHOOLS, AND WE CANNOT ALLOW THE U.S. GOVERNMENT TO OUTLAW GUNS. REMEMBER NAZI GERMANY DID THAT, WHICH MADE IT EASY FOR HITLER TO ARREST THE JEWISH POPULATION!